Behavior therapy is a treatment that helps change potentially self-destructing behaviors. It is a therapy to help replace bad behaviors with good ones. It as well helps cope with difficult situations. You do not have to be diagnosed with a mental disorder to be treated! The goals for Behavior therapy is reduced incidents of self-harm, improved social skills, better functioning in unfamiliar situations, better pain management, less outbursts, etc. Cognitive Behavioral Therapy is more focused on the present, more time-limited, and more problem-solving oriented. Patients learn a variety of skills to use for the rest of their lives such as identifying distorted thinking, modifying beliefs, relating to others in different ways, and changing behaviors. 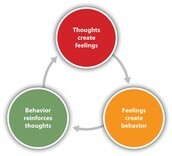 The goals for treatment for CBT is to help individuals achieve a remission or their disorder and to prevent relapse. Behavior therapy and Cognitive behavioral therapy both help individuals with mental health disorders or without. They are both helpful tools for patients suffering with depression or anxiety and helping individuals manage stressful situations. They also use a variety of techniques and skills during treatment. They can be used together in treatment because they both help you become more aware of your inaccurate or negative thinking to view more challenging situations more clearly and learn to respond in a more effective way. They can be used separately in therapies because behavior therapy can also be used on patients with chronic diseases as well as coping with emotional grief whereas CBT is more focused on personality and the behaviors. The therapy best used for procrastination is Cognitive behavioral therapy. CBT will help identify the small goals; to help reduce stress and the feeling of being overwhelmed by large projects. You will also be able to create a to do list and categorize it in sections that are urgent or can be put off until later. The therapy will also help to use the individuals natural patterns. If an individual likes to do things in the morning, afternoon, evening or whenever they have the extra time. Procrastination can result in depression, anxiety, or guilt if it is done excessively and that is why it is important to stay on track to achieving a goal.